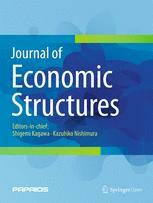 Journal of Economic Structures is a peer-reviewed open access journal published under the brand SpringerOpen. It is an international journal that publishes theoretical and empirical articles that apply to a wide range of formal analytical instruments and statistical techniques to explore the structural interdependencies among various activities in the economy. We collect papers dealing with broad issues, covering subjects such as technological and lifestyle changes, qualitative innovations, trade and trade networks, disaster propagation, ecology and development, among others, where structural understanding is essential. The journal supports communication among various related disciplines and encourages contributions from regional practitioners.